Since more care and attention is given, custom built buildings by the owners are often better as opposed to those constructed by investor/developers just looking for a return. The special features of this property include all concrete construction including the twin-T roof; 24′ high ceilings; fully-sprinklered; FEC railroad track service; and an extra large truck court for an additional 19 trailer positions. The buyers are Sandra and Isaac Lapciuc of Del Valle Brands, a Miami distributor that distributes household goods throughout the Caribbean and Latin America. Learn more about them at www.DelValleBrands.com. The buyer interviewed over twenty lenders, however the SBA financing was ultimately provided by City National Bank. ComReal Miami was the only broker involved. The ComReal Miami Warehouse Team consists of Edward Redlich, Christopher Spear, Edison Vasquez, and Stephen Smith. 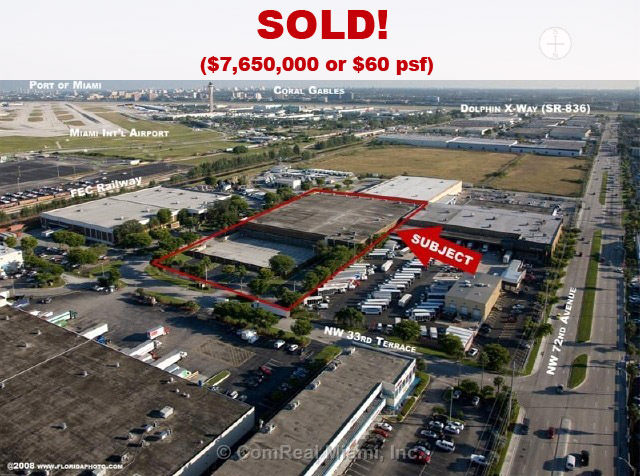 The property was marketed via the property’s website: www.MiamiAirportWarehouse.com and the international, commercial real estate organizations SIOR and CCIM. ComReal targeted end-users who were involved in light manufacturing, logistics, distribution, aviation and more. Companies that may need the FEC railroad service were also targeted. On a side note, the property was originally occupied by Faith Freight Forwarding and then Gold Coast Beverage Distributors. Congratulations on the sale. Your articles and detailed reporting of sales and listings have been essential in keeping market participants, lenders and appraisers informed on market trends. Congratulations. Great way to end the year! !